Valucre is the story of your characters and how they interact with other characters in the world, whether those interactions are epic tales that span the globe or the intimate dramas of everyday life in a local town. What you decide to write, the actions you decide to take, can have as much or as little impact on your personal storyline and on the surrounding world as the effort you choose to put in. Knowledge about Valucre by its inhabitants should be taken as mythological rather than empirical. This means that what a people believe may not actually be accurate, and is subject to ongoing interpretation, debate and modification. There is no indisputable theory for how the universe came to be. Instead there are dominant and recessive theories, myths and worldviews which vary depending on where you are and who you ask. Valucre is twice the radius of Earth and, like Earth, is made up mostly of water. For simplicity's sake, Valucre has similar seasons, weather, atmosphere, flora, fauna, etc. Valucre's creatures are also open by design, meaning that while nations may have their own bestiary index, their own unique creatures or versions of existing creatures, players are not limited to these and can create their own as long as they adhere to mild powers. Despite a high level of scientific understanding among its people, the presence of magic has confounded efforts to get an accurate measure of the planet's age, and has complicated cartography and archaeology for eons. Different nations may keep different calendars for religious or cultural reasons but also keep track of a universal World Time. The universal calendar shared throughout the nations indicates that Valucre is in its 18,597th year World Time (WT). Colloquially this is referred to as 597 WTA (World Time Abbreviated, cutting off the millennia digits). For simplified timekeeping purposes, Valucre advances at a rate of 1:1 with the real world, usually in June. Continents and territories tend to favor a major theme while also participating in the shared game space. This means that while one location on the planet can be high fantasy (like Orisia or Alterion), another can employ magitech and airships (like Terrenus and Genesaris), and another might favor futuristic scifi (like Renovatio). Because of the complex interplay between magic and technology it's difficult to say that one nation is more 'advanced' than another since different means can be employed to similar ends, though that doesn't stop different kingdoms from trying. Keep in mind that these descriptions are not meant to isolate one setting from another and that your character can travel freely between each location, having to surpass obstacles magical and mundane. Also keep in mind that settings have a general theme but are not restricted to that theme. Considering these continents occupy the same world, expect to see some truly odd and wonderful sights. 'Fast travel' is a common plot device; you don't have to play out the travel between locations. To learn more about a location click on the name, and if you have questions visit the Ask Me Anything (AMA) of the location. Unii sounds like Russian. Unii is a constructed trade language designed to bridge communications between people who do not share a native tongue. It is employed most commonly by entities with international dealings, such as trade, diplomacy and criminal enterprise. Renovatio lies between Genesaris and Terrenus and is made up of multiple territories. This is a gateway into what is commonly referred to as "the infinities of the spirit world", a portal which leads to endless realities and dimensions and through which come travelers from far off worlds. It can deposit you anywhere on the planet, not just near itself. Not a part of the canon world of Valucre. Alternative is where members can go to host roleplay that wouldn't fit in the world of Valucre. Roleplay that takes place on other planets, on modern-day earth, or that surpass the mild powers limitations of Valucre can be hosted here. Roleplay here must still abide by the code of conduct. 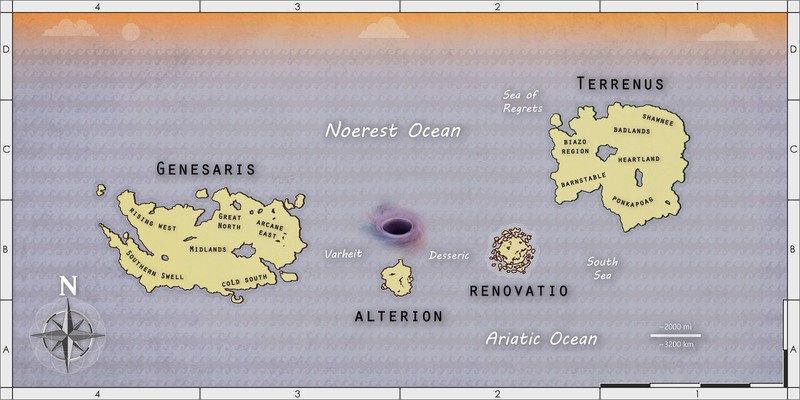 As of the introduction of the vortex, characters can freely travel from Alternative to Valucre, and must adhere to the rules of the local realm. Valucre is a fantasy setting where magic and science have evolved separately but in parallel. This results in areas which vary drastically from one another. In a single nation you can have locations where people use coal and oil, other areas where they use steam and electricity - one area where magic is sacred and divine, and another where it is used for convenience, or doesn't exist at all. You can read more about the laws of magic in its dedicated article. The laws are open by design to allow members to use any ability or system they please, as long as those things adhere to mild powers; actions that observe the laws are considered as having canonical backing. Board leaders may have local systems which will override or supplement the universal system. Like any system, the laws are a 'living document' and subject to change.